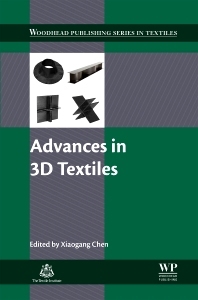 Advances in 3D Textiles presents the most recent advances in the production of three-dimensional fibrous structures and how their use has resulted in the creation of novel fabrics and applications. The text covers a wide range of fabric types, including their structures, properties, and uses in the textiles industry. Beginning with the various types of woven three-dimensional fabrics, the text then examines 3-D knitted, braided, and non-woven textiles, and the main applications and uses of three-dimensional textiles. Dr Xiaogang Chen obtained his PhD in Textile Engineering from the University of Leeds in 1991. He is currently a reader in technical textiles in the School of Materials, The University of Manchester. In the field of modelling, he worked on mathematical models leading to the creation of CAD software for 2D and 3D woven fabrics. He also researched into geometric and mechanical modelling of textiles for engineering technical textiles. He has applied his modelling approach into the prediction of textile behaviour in energy absorption, fluid filtration, textile composites and ballistic protection.